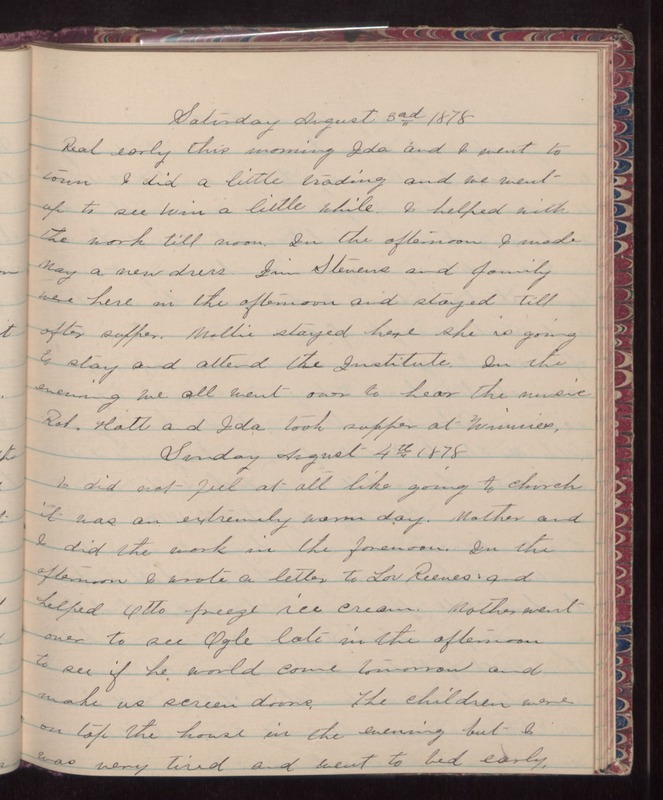 Saturday August 3rd 1878 Real early this morning Ida and I went to town. I did a little trading and we went up to see Win a little while. I helped with the work till noon. In the afternoon I made May a new dress. Jim Stevens and family were here in the afternoon and stayed till after supper. Mollie stayed here she is going to stay and attend the Institute. in the evening we all went over to hear the music. Rob, Hatt and Ida took supper at Winnies. Sunday August 4th 1878 I did not feel at all like going to church it was an extremely warm day. mother and I did the work in the forenoon. In the afternoon i wrote a letter to Lou Reeves and helped Otto freeze cream. Mother went over to see Ogle late in the afternoon to see if he would come tomorrow and make us screen doors. The children were on top the house in the evening but I was very tired and went to bed early.